If you’re in Palermo and you want to discover its suggestive surroundings there is a stop that you really shouldn’t miss: Bagheria, a fascinating, old, beautiful city in the province of Palermo with a curious nickname: “City of the Villas”. Called Baaria in Sicilian, it is mainly famous for its 18th century summer residences built by the ancient Palermitan aristocrats, who chose this corner of paradise for their summer vacations. If you love art, and particularly Baroque and Renaissance art, Bagheria is the ideal destination to take a dip in the past thanks to its simply unique monumental heritage. Bagheria is located a few km from Palermo: browse now our luxury villas in Sicily selection and choose the villa of your dreams to spend an unforgettable holiday in Sicily! Bagheria is a city that oozes art and its great personality has inspired and bewitched many artists of various throughout its history, bound to this place, its colors and its melancholic charm forever: writers Wolfang Goethe and Dacia Maraini, the painter Renato Guttuso and the director Giuseppe Tornatore, “sons” of Bagheria. Giuseppe Tornatore even brought Bagheria to the big screen with great unforgettable movies such as Nuovo Cinema Paradiso (which won the Academy Award for Best Foreign Language Film at the 62nd Academy Awards) and Baaria. Not all the Bagheria villas can be visited because some of them are private or open sporadically for special events, and other ones are today public offices. By the way, the oldest mansion is Palazzo Butera, dating back to 1658, built by Giuseppe Branciforte, an important nobleman from Palermo, with its breathtaking frescoes and precious crystal chandeliers, together with a rich old picture gallery. Although the most famous historical villa is Villa Palagonia also known as Villas of Monsters: why? The Villa, wanted by prince of Palagonia Francesco Ferdinando Gravina e Bonanni in 1715, is famous for the hundreds of tufa statues depicting grotesque characters, orcs, centaurs, ugly monsters and anthropomorphous figures which are placed everywhere with the purpose of representing the guests, friends and visitors of the building. But these funny statues, bizarre and poliform, are mixed with a precise and baroque regularity of architecture. During the 18th century it became the destination of the Grand Tour Travellers and it was a place famous all over Europe as the “most original place of the world”. Remarkable are also its interior details with marble and colored glass, such as the Salone degli Specchi (Room of Mirrors), with its ceiling covered with glass mosaics representing the family ancestors and the rulers of Europe. Another worth visiting villa is Villa Cattolica, appearing to our eyes almost like a castle with its high crenellated walls. It houses since 1973 a permanent exhibition of the master Renato Guttuso and the headquarters of the Gallery of Modern and Contemporary Art with works of artists such as Carlo Levi, Corrado Cagli, Carla Accardi Antonio Sanfilippo, Angelo Savelli. Last but not least Villa Valguarnera and its majestic beauty. The old mansion of the Valguarnera’s dynasty is a magnificent work of art of the 18th century. Its layout shows some esoteric influences, its shape has been conceived as the symbolic route that leads from earth to heaven, with a particular emphasis on the high ground called ‘montagnola’ from where you can enjoy a wonderful view over Bagheria. Inside the main floor there is a large oval hall, designed by the italian architect Vaccarini, decorated with frescoes and paintings of the ancestors of the Valguarnera family. The villa has recently been the setting for a Dolce & Gabbana spot with Sophia Loren. The site is just unique and really impressive, not only for its aesthetic beauty and for the harmony of the architectural forms, but also for its historical value, one of the highest in Italy. 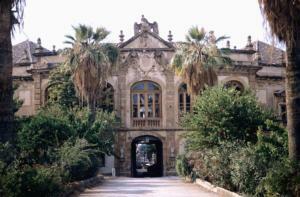 So, if you are near Palermo do not miss the opportunity to plan your visit in Bagheria the city of villas! Top picture: Villa Palagonia. Author: JpBazard. Source: Wikipedia.